Euthyroid sick syndrome and Wilson Temperature syndrome are both associated with low serum levels of thyroid hormones in euthyroid patients with nonthyroidal systemic illness. There is decreased T4 to T3 conversion in both problems. Wilson’s Temperature syndrome is the cluster of debilitating symptoms brought on the physical and emotional stress due to maladaptive slowing of the metabolism. In Euthyroid sick syndrome, the thyroid blood test comes out abnormal most of the time but there are no low thyroid symptoms whereas in Wilson’s temperature syndrome, the thyroid blood tests are typically normal even with severe low thyroid symptoms. Wilson’s Thyroid syndrome persists for years after non thyroid stress or illness has passed which is not the case with Euthyroid Sick Syndrome. In Euthyroid sick syndrome, the condition does not require treatment because there are no symptoms and the tests go back to normal when the stressful illness has passed. Euthyroid sick syndrome is caused by increased circulating cytokines and other inflammatory mediators resulting from the underlying nonthyroidal illness. It is not a thyroid disorder. The thyroid system is responsible for maintaining normal body temperature or normal metabolic rate. The active thyroid T3 is the one that goes into the nucleus of every cell of the body and stimulate the rate at which DNA is transcribed. It determines how fast we live. But, when a person is in stress, the cells of the body convert less T4 into T3 causing slower metabolism and low body temperature. T4 is shunted towards Reverse T3 which is inactive. T4 and RT3 can speed up the destruction of the enzyme that converts T4 to T3. The body temperature is average below 98.6 degrees. It is more common in women then in men. It is more common in nationalities like American Indian, Irish, Scot, Russian, Welsh etc It has a hereditary component as it is common among those whose ancestors survived a famine or who have genetic makeup that is consistent with light color skin, red hair, light colored eyes. It is especially brought on by stresses such as childbirth, divorce, death of loved one, job or family stress, surgery, accidents, excessive dieting etc. WTS is more common than hypothyroidism and is treated differently from hypothyroidism which is a lifelong disorder. The symptoms come and go. At times the symptoms show up within two months of a particular stress. Fatigue, depression, fluid retention, unintentional weight gain, dry skin, headaches, high blood pressure, ,low pain tolerance, irritability, low libido, insomnia ,anxiety , inability to concentrate and premenstrual symptoms are mostly common. The symptoms worsen under physical, emotional and mental stress. Diagnoses is mainly based on excluding hypothyroidism. Treatment focuses on underlying illness, thyroid hormone replacement is not done in this case. Wilson’s thyroid syndrome makes the patient suffer indefinitely if treatment is not done, but it is completely reversible and responds very well to proper T3 therapy. Wilson’s thyroid syndrome is treated using a “ therapeutic trial method” which means the treatment is done on a patient to see how well it works as the condition is not easily identified with tests. This medicine is widely used in Ayurvedic practice to fight urinary tract related disorders. It treats constipation, indigestion, problems relating to skin and abdominal pains. It is very useful in disturbed metabolism of kapha and vatta dosha. It is beneficial in relieving symptoms associated with Euthyroid sick syndrome without any negative impacts on health. This formulation is a wonderful herbal supplement in the form of powder to relieve joint pains, muscle stiffness, skin dryness, weakness, memory impairment etc. This Churana balances the three doshas. It also restores normal digestion, helps with weight loss. The formulation has anti-inflammatory properties. Hakam Churan is made with simple ingredients like methi, kalongi, ajwain and chandershoor. This product is completely safe to use with no side effects. Guggul herbal extract is best to lower bad cholesterol levels as well as high blood tri glyceride levels. The herb is known to have antioxidant properties and anti-inflammatory properties. Guggul has the ability to stimulate the thyroid gland to increase its hormone production thus increase metabolism and eventually leading to weight loss. These capsules are prepared from the herbal extract called mandookparni or Centella Asiatica. The herb helps to improve thyroid functions. It is used to fight fatigue, depression, anxiety and aids in improving memory and intelligence. It is useful in treating skin disorders and works great for nails and joint repair and growth. Certain herbs are very useful in helping the body withstand stress. These herbs are called adaptogens or adatogenic herbs as they help the body adapt. 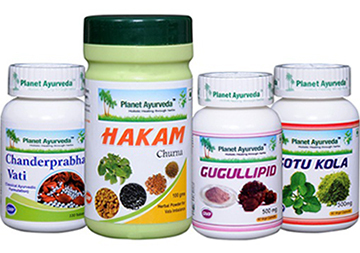 These herbs include Ashwagandha, Holy Basil etc. Ayurvedic physicians also recommend the use of black walnut, Spirulina and Black cohosh to treat Euthyroid sick syndrome. Withania or Ashwagandha is an Ayurvedic remedy that regulates the function of thyroid, thereby increasing both T3 and T4 levels. The herb is known for its anti-anemic properties. It also enhances immunity. All these herbs help to reduce stress hormone levels and calm down the central nervous system so that the body can naturally move back into balance. These herbs also help to protect the brain and heart from high levels of stress hormones.